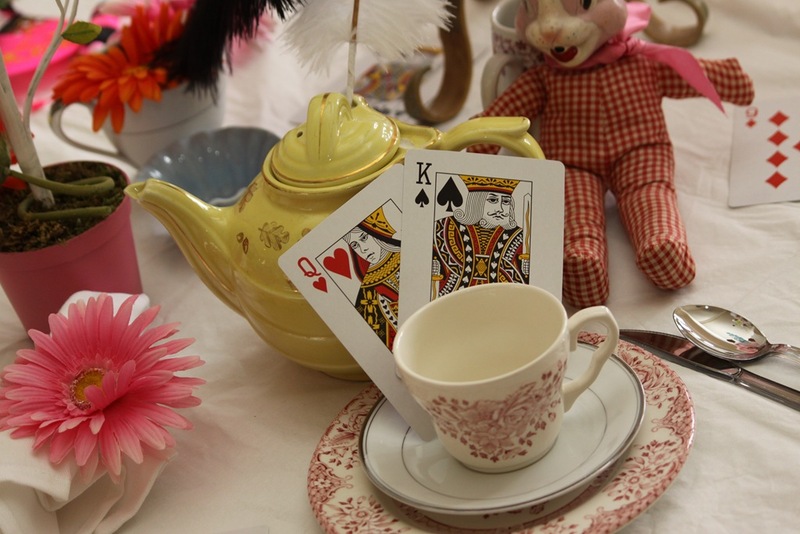 “I’m late, I’m late, for a very important date…” Alice, Butterflies, The Queen of Hearts, Red Roses, Mad Hatter Hats and more! 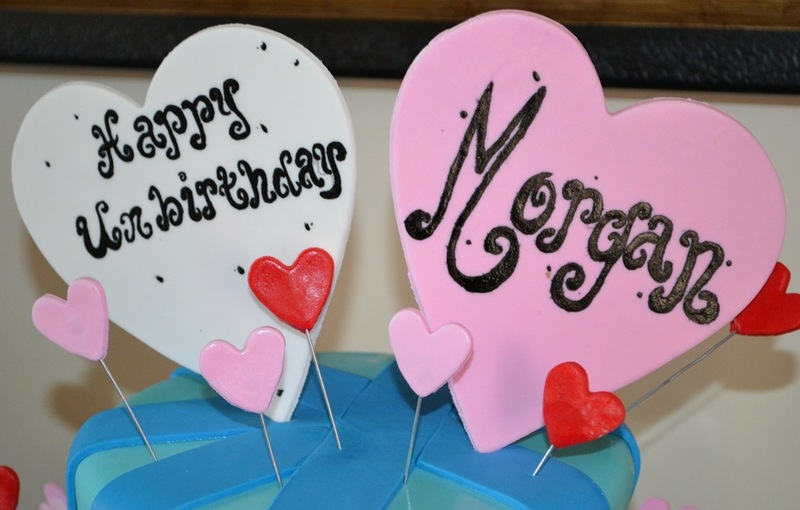 The 3 Decorating Divas are at it again throwing a very lucky 7 year old little girl and Unbirthday Party! Below, we have listed out some of our ideas. 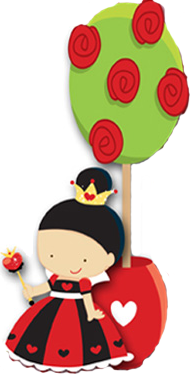 We had several great cute, in-expensive decorations, which we have listed below. First, we made flowers out of tissue paper. 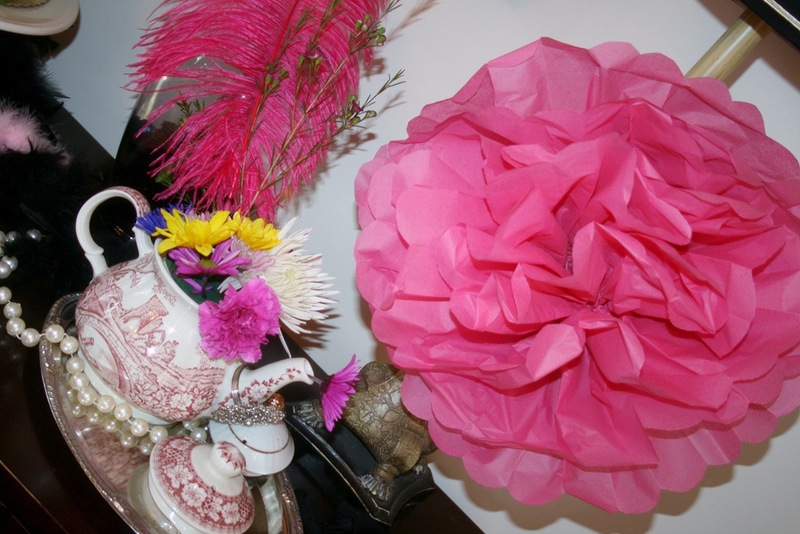 Take 4 – 5 sheets of tissue paper and fold them in according style about an 1” thick lengthwise. When you have folded them, round off the ends by cutting them. Then take pipe cleaners and tie them in the center. Then very carefully, fan out each side and separate each piece of tissue paper. If you need more instructions, simply search the internet for Mexican Flowers and there are tons of sites that walk you through it more. We wanted to dress up the chairs, which we had several different types. So, we went to the $1 store and bought seven plastic table clothes in several different colors. One table cloth would cover two chairs. We just simply purchased the longest table cloth available and cut it in half, longwise. 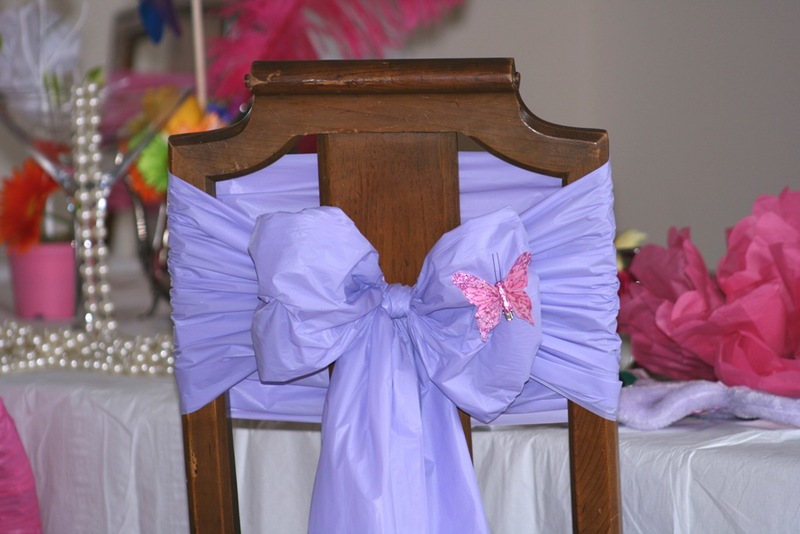 Then making sure that the chair was in the middle of the table cloth, we tied a bow and embellished it with different accessories. Below are the cute daisy’s we found at Michaels and also cute butterflies. 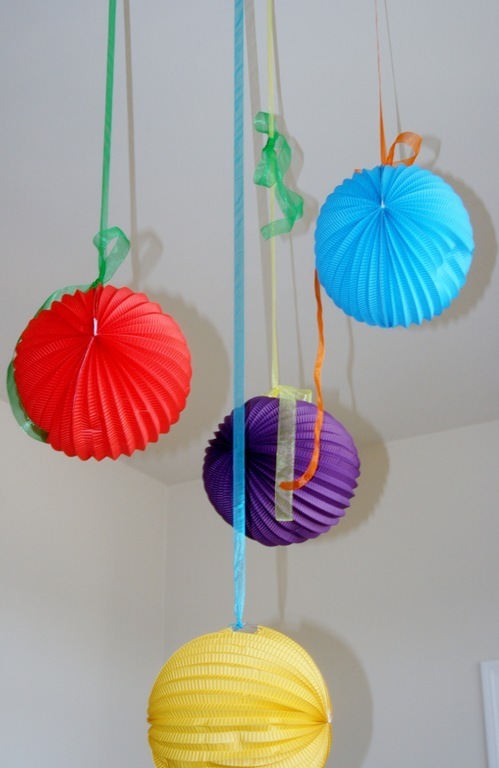 We also hung lots of paper round balls with ribbon from ceiling in the living room which had vaulted ceilings. That balanced out the chandelier from the dining room. 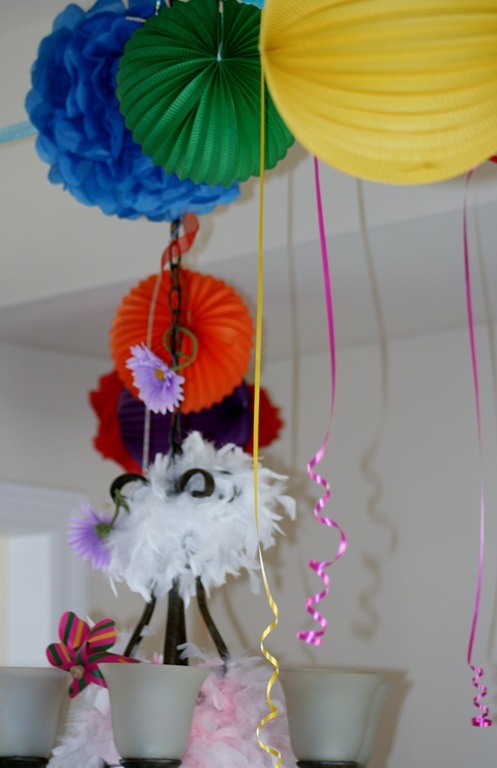 Also, to add a little more color, we used ribbon from each corner of the dining room and tied each one to the hanging chandelier. For each strand, we hung up more round paper balls, the paper flowers and then simply just hung ribbon down making it curly at the end. we purchased the paper round balls from Oriental Trading. 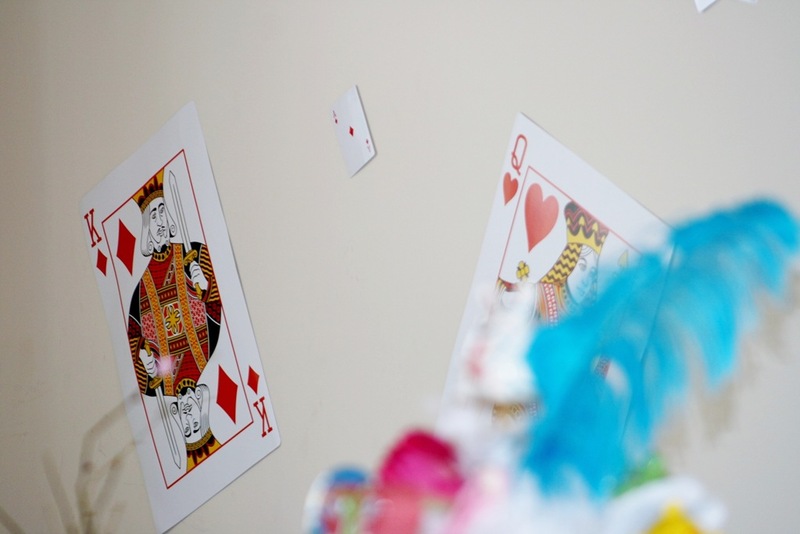 Another cute idea for the walls and table is simply just a deck of cards! We purchased a large deck of cards at the $1 store and the giant cards from Oriental Trading. At Michaels, they sell two sided sticky squares made to hang up party decorations. They are easy to remove and only one of the butterflies kept falling down. 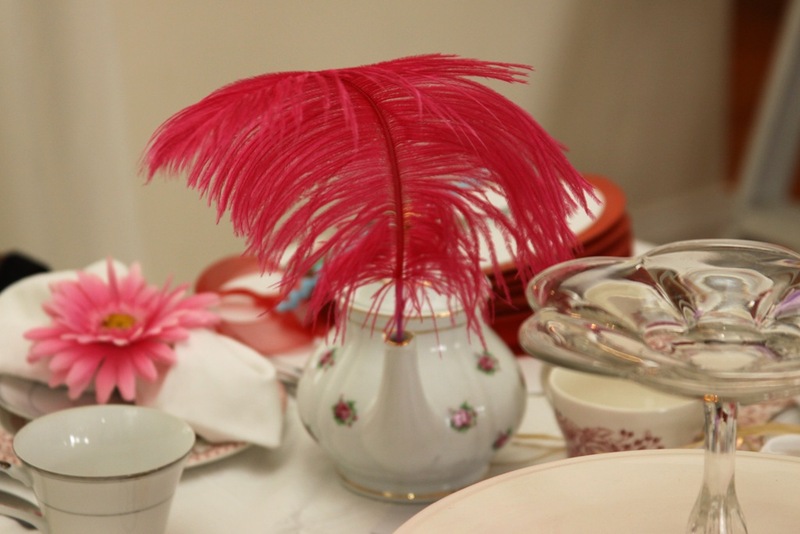 From Hobby Lobby we purchased several different Ostrich Plume feathers and placed them around the room and table. 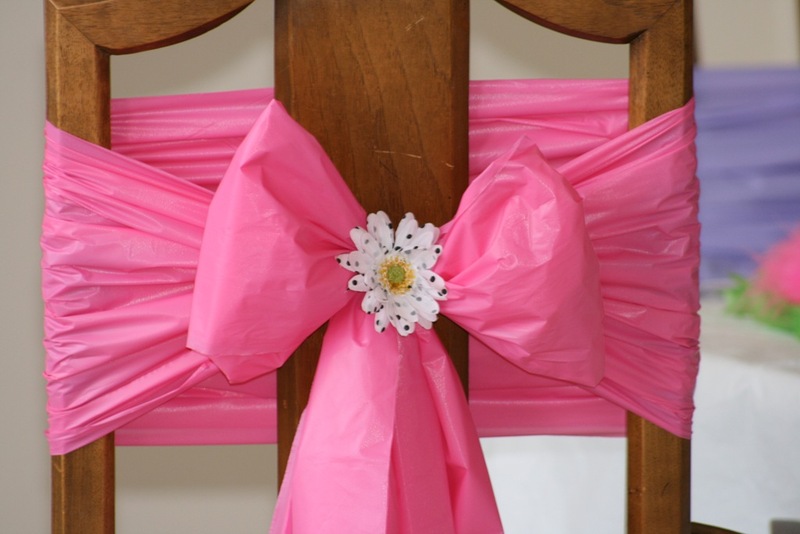 We put them in a flower arrangement or on the back of a chair or as a decoration on the drapery. We had in our inventory long strands of pearls which we draped over the chandelier and candelabra. 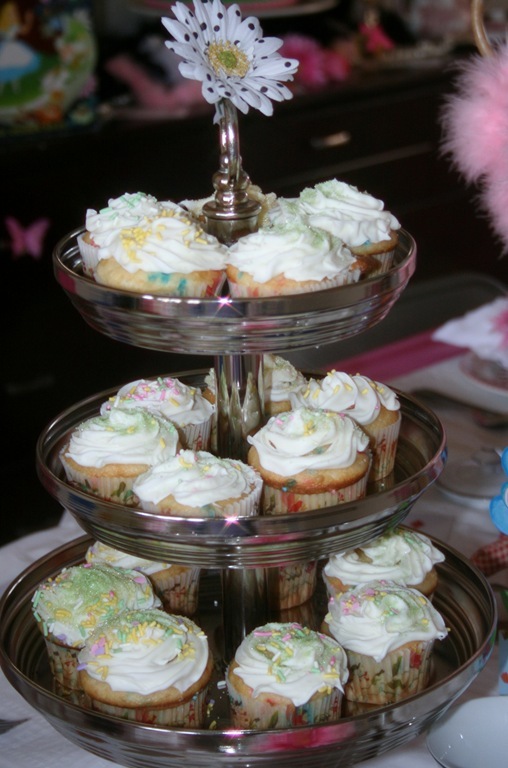 We also put them around the cake with the feathered boas. We had lot and lots of flowers, both real and silk from Michaels. 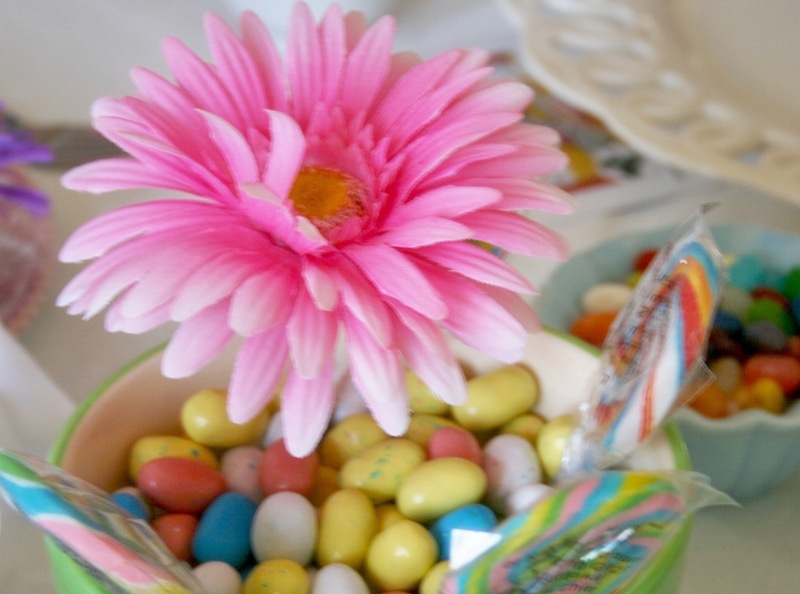 Anything that wasn’t holding candy or food, was going to be holding flowers. 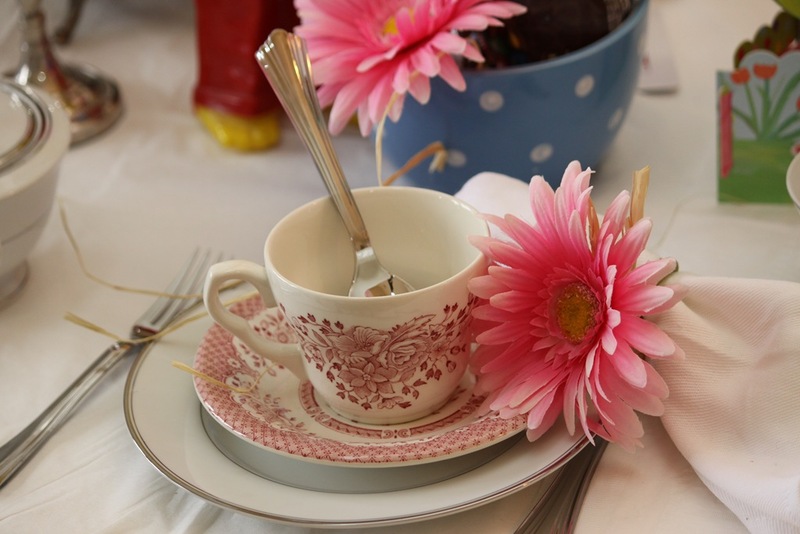 Just simply buy the floral foam (make sure to get the type for real flowers) and cut small pieces to put into the vase or tea pot. Then just take the flowers and cut them short and stick in the foam. Don’t forget the water!! 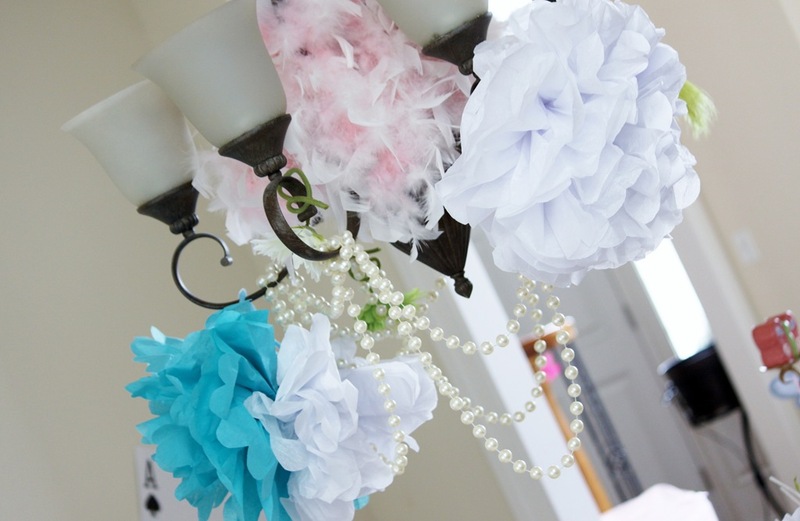 Then add any cute decoration like a feather or multi-colored fans (we found these at the $1 bins at Target). 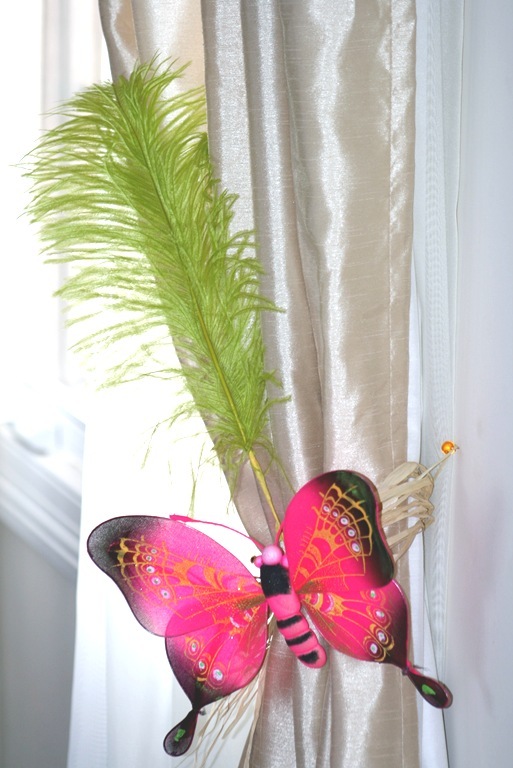 We also used Butterflies and dragonflies that we purchased from various places found on the internet. 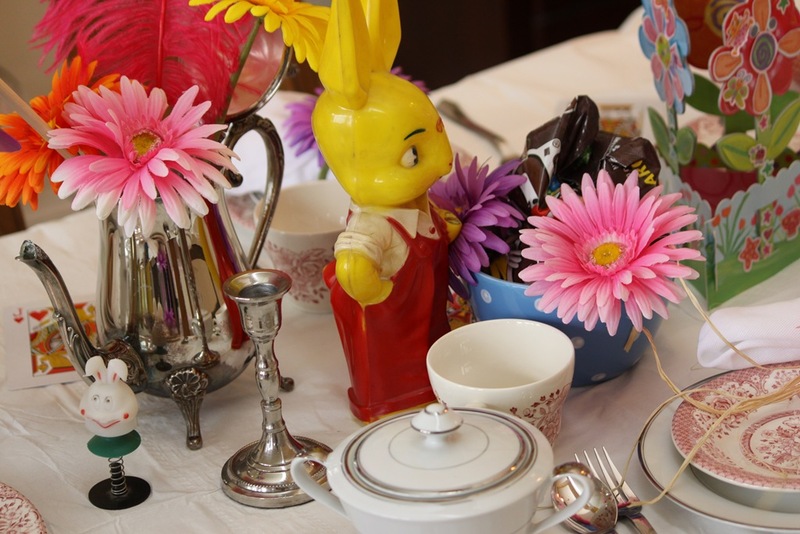 The antique rabbits were a nice touch and came from our personal inventory. 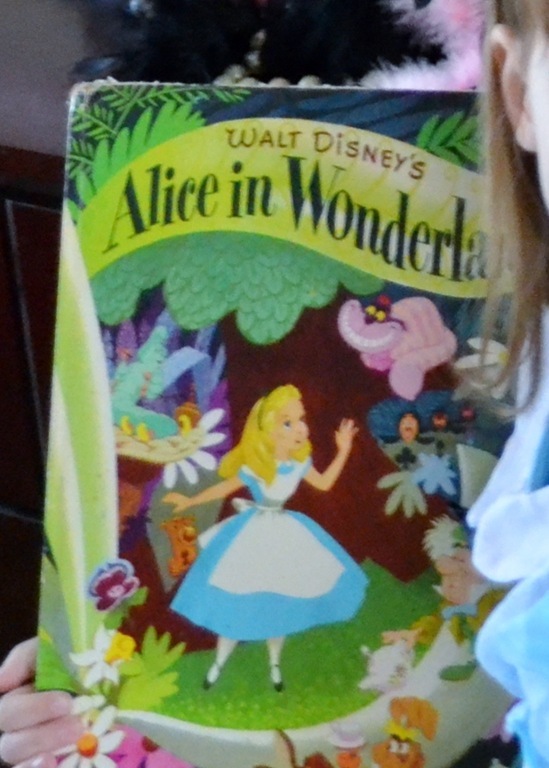 Also, the vintage Alice In Wonderland book was actually Morgan’s father’s book when he was 4 yrs. old! Added a nice little personal touch. For another cute fun idea, I went to my local $1 store and bought two fake rose bunches. I cut them off at the stem and stuck them in my planters by my front door. Well, the food selections we made were half your typical party food for the adults who were not participating in the tea party. This consisted of pizza delivered by Giordano’s, salad, fruit, chips and salsa and other yummy treats. For the tea party, we served chicken nuggets in the shape of Mickey Mouse for the kids that didn’t like the other food. We had chicken salad sandwiches on croissants with mandarin oranges, cucumber sandwiches (ask me for the fabulous recipe by Rena Nash). For beverages, we had lemonade served in a large container with drink me sign. 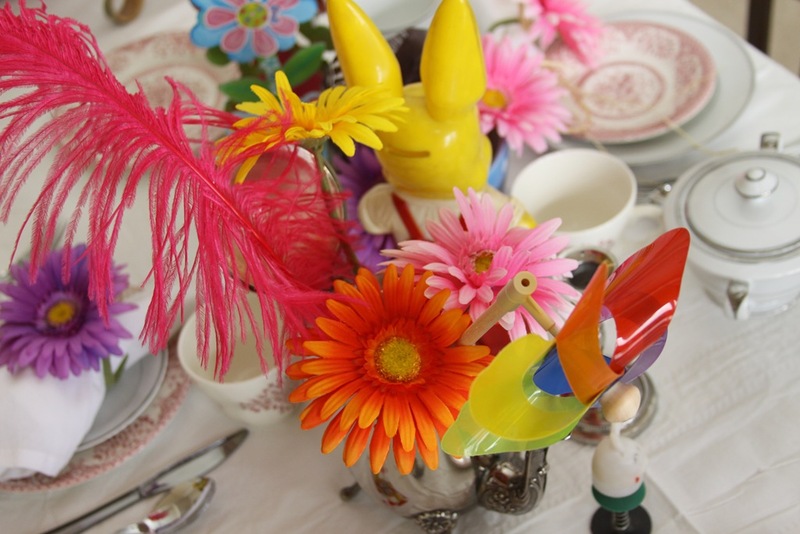 As seen below, we used real china for the place settings and to add to the crazy Mad Hatter Tea Party theme, we made sure to mix two different sets of china. We also used the new diamond Brilliance plastic flatware purchased at Target just to add a bit of elegance. 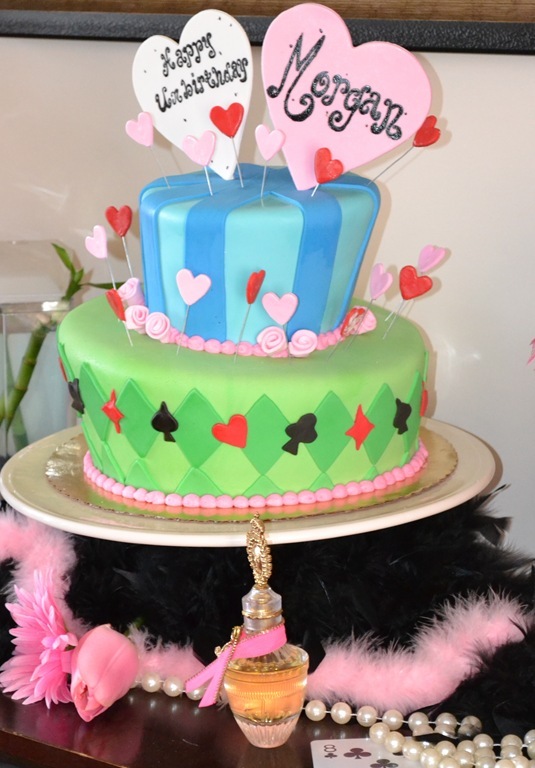 We went to one of our favorite bakeries in the area, The Cake Box www.thecakeboxhome.com with an idea of a wacky cake with the Alice In Wonderland theme and they designed for us this cute yummy cake. It was awesome and there wasn’t one piece leftover! Of course, we purchased a cute Alice In Wonderland costume for the birthday girl and had her wear cute knee high socks that were black and white polka dots to go with the costume. For her guests, we had masks which we found in the $1 bins at Target. Then, as a bonus, we made the Mad Hatter Hats below. These hats took a little more time, but the girls absolutely loved them!! First, we purchased the accordion style hats from Oriental Trading (seeing a theme here??). Then we purchased from Michaels the multi-colored tissue paper pack and cut them in 4×4 inch squares. Using glue, we glued these squares scrunched up on the rim and top of the hats. 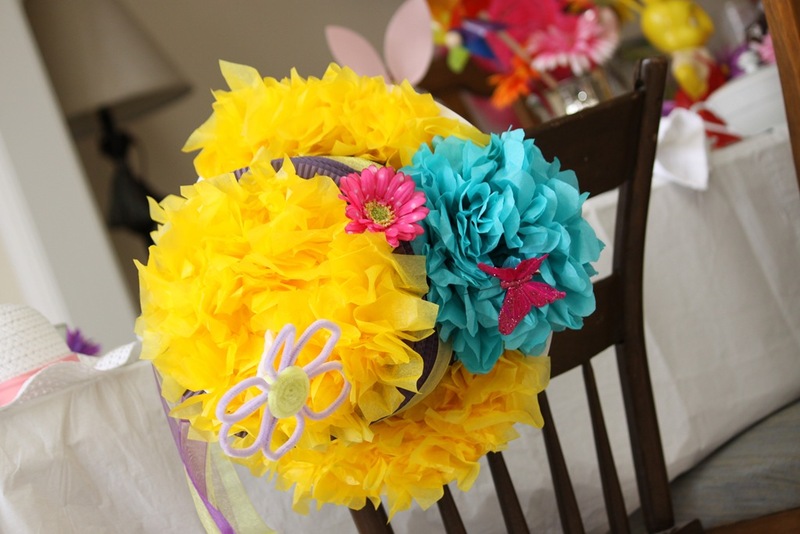 We tied ribbon around the brim to add a little fun. 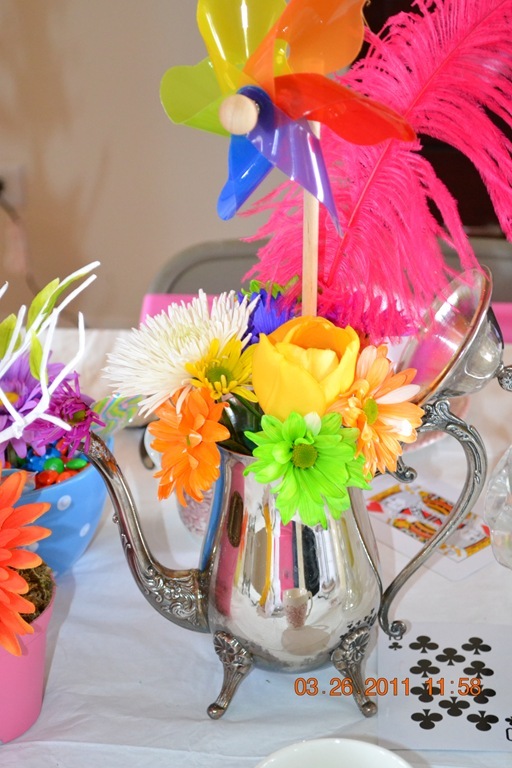 We also made smaller versions of the tissue paper flowers, added the butterflies and flowers we got from Michaels. 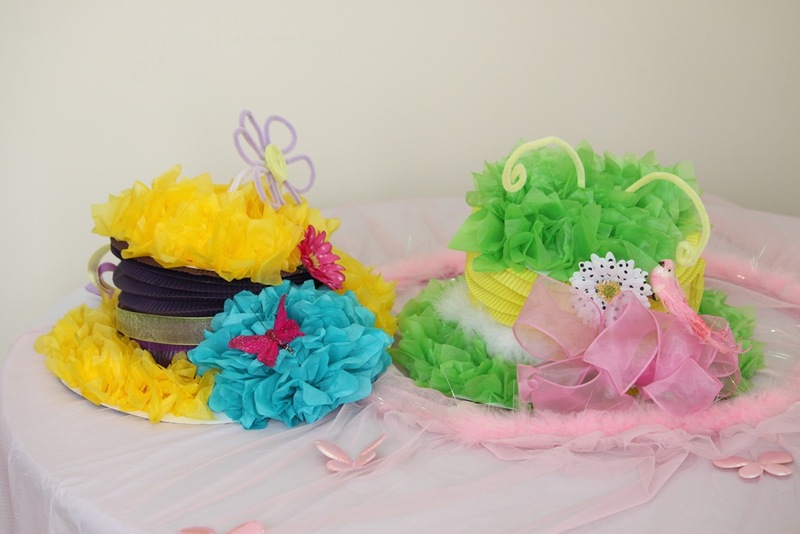 Then we got real creative and made something fun coming out of the top of the hats, shown below are a flower and butterfly antennae. The hats did slip down, so we just stuffed white tissue paper inside them to help them stay on the girls heads and up so they could display the fun decorations. Each guest got to pick them out and take one home! We didn’t play that many games because the girls seem to do their own thing, however, the games we did manage to get in were of course, musical chairs and the freeze dance. But mostly, the girls liked to dress up in all the cute Disney costumes we had available. Oriental Trading sells these adorable gift “boxes” that are shaped as a wedding cake from Oriental Trading. They stack together to make the wedding cake shown below. 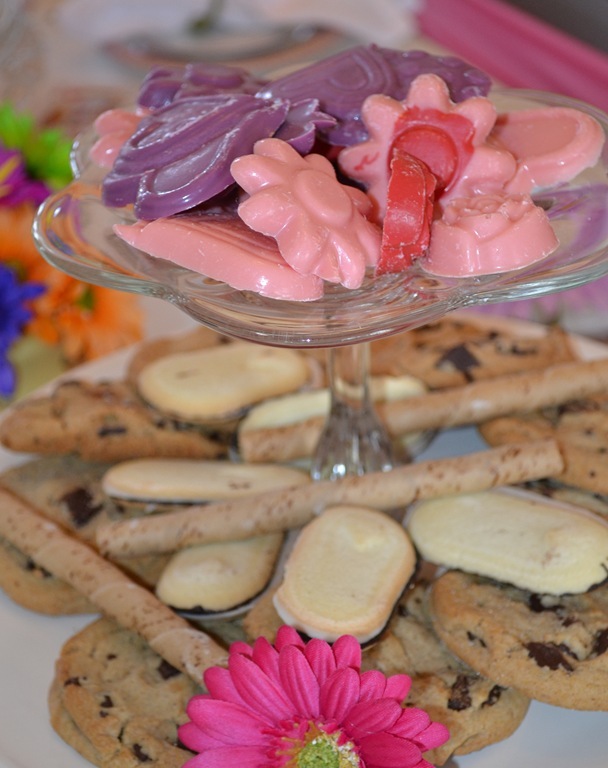 We placed them on a cake plate and put it in the center of the gift table. 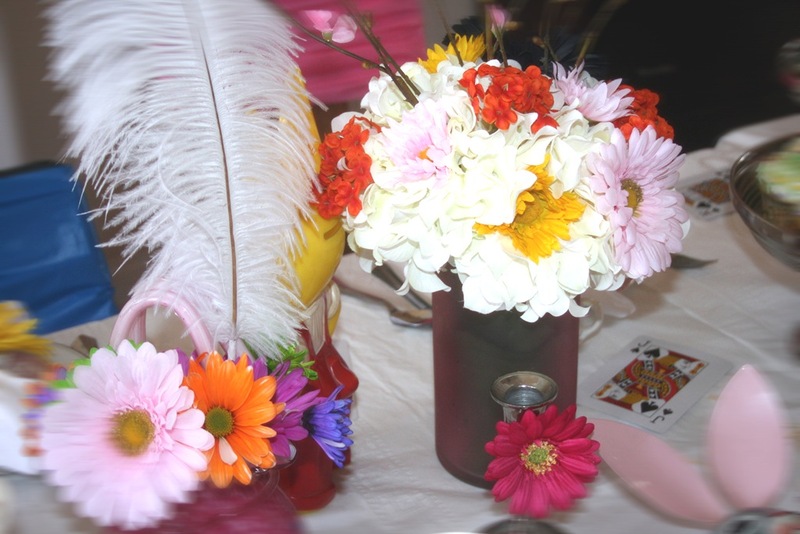 We put the Mad Hatter hats all around the gift boxes and put a bow with flowers on the top. 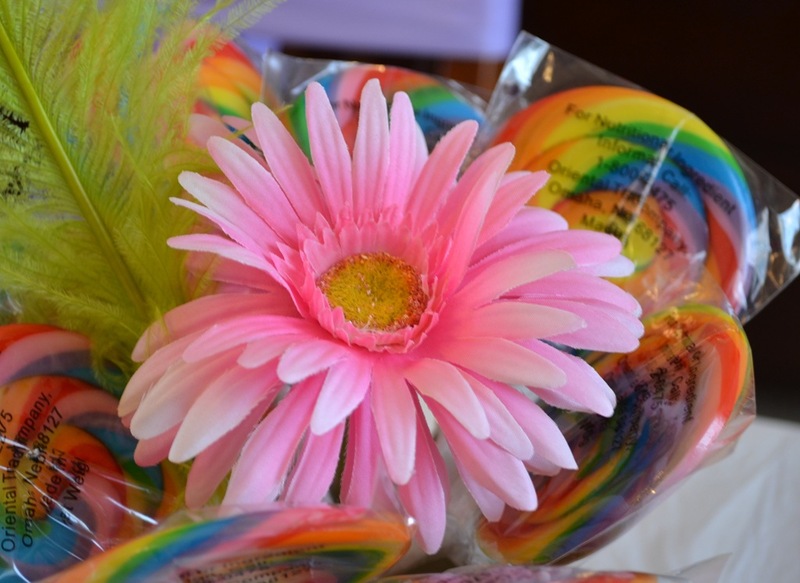 For party favors, we purchased, again from Oriental Trading flower rings, beanie babies that were lady bugs, butterflies and other cute garden type animals, and of course candy. We draped the table with a table cloth and pink tulle. I hope you enjoyed this blog… it was a lot of work!! 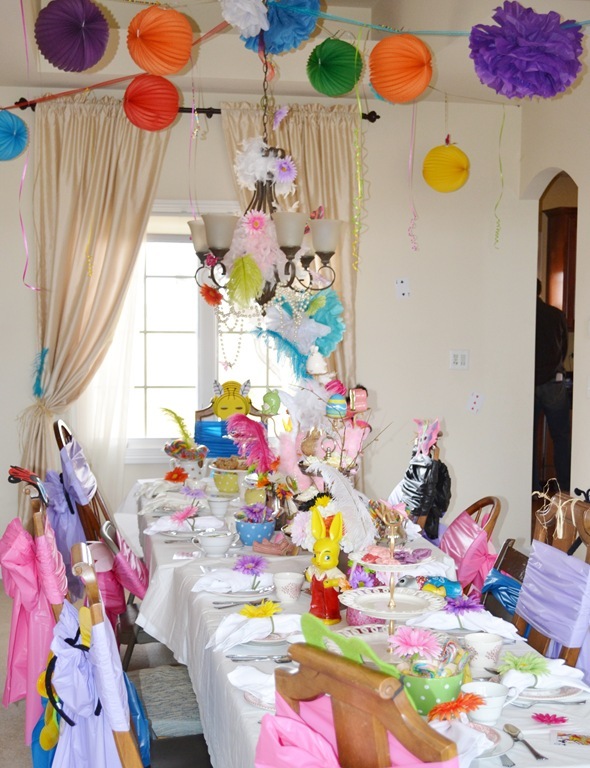 3 Decorating Divas recommends searching the internet for starter ideas, having lots of fun with your kids making the decorations, plan plan and plan so more. Know your room and keep a budget! It is very easy to overspend when those creative juices are running!! !